A close-up view of Indian-pipes, which grow in shady, rich woods like the kind in Westborough. Finding ghostly clusters of Indian-pipes by the side of a shady path in Westborough's summer woods is an experience no one should miss. Indian-pipes (Monotropa uniflora) grow in shady, rich woods of the kind we have in Westborough. The entire plants are waxy white and somewhat translucent, making an eerie sight. Not surprisingly, another name for the plant is ghost flower. Others include wax plant and corpse plant. Look for Indian-pipes in warm weather a day or so after a good summer rain. You'll find them in deep shade, since these white plants lack green chlorophyll and have no use for direct sunlight. They come up from June through September, whenever conditions are right. They're 6 to 8 inches high and often grow in clumps. The name Indian-pipes comes from the shape of the plants in bloom. With thick, scaly stems and down-turned single blossoms, they look a bit like upside-down white clay pipes. Once the plants begin to produce seeds, they straighten up and turn black. The dried black clusters can last in the woods through the following spring. People often wonder if Indian-pipes are a kind of odd mushroom or other fungus, but they are not. Instead, they are flowering plants that have lost their leaves and their green chlorophyll in the course of evolution. Like other flowers, Indian-pipes produce nectar, pollen, and seeds. You might even notice a bumble-bee swinging by to check out the nodding white blossoms. Unlike green plants, Indian-pipes do not make their own sugars. Instead, they indirectly live off tree roots, connected by soil fungi that serve as intermediaries. This complex relationship makes them difficult to transplant or to grow from seed in a garden. 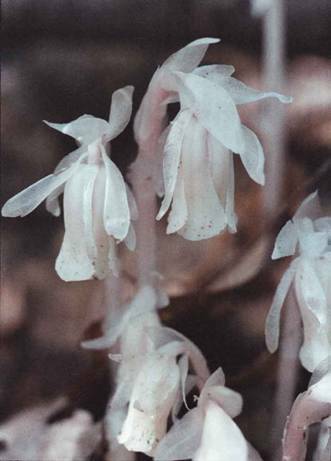 If you try to pick Indian-pipes, you'll find that the stems turn black and ooze a clear jelly. Because the plant seems to melt when it is picked, it has also been called ice plant. Like so many local wildflowers, Indian-pipes have a history of medicinal use. Native Americans and physicians of earlier times used the juice from Indian-pipes on sore or inflamed eyes. Tea made from the roots served as a sedative and a treatment for convulsions, epilepsy, and nervous irritability and restlessness. Indian-pipes are native to North America and can be found across the continent.